[PDF] The Mirage Man: Bruce Ivins, the Anthrax Attacks, and America's Rush to War | Free eBooks Download - EBOOKEE! Description: For the first time, Pulitzer Prizeâ€“winning journalist David Willman tells the whole gripping story of the hunt for the anthrax killer who terrorized the country in the dark days that followed the September 11th attacks. Letters sent surreptitiously from a mailbox in New Jersey to media and political figures in New York, Florida, and Washington D.C. killed five people and infected seventeen others. For years, the case remained officially unsolvedâ€”and it consumed the FBI and became a rallying point for launching the Iraq War. Far from Baghdad, at Fort Detrick, Maryland, stood Bruce Ivins: an accomplished microbiologist at work on patenting a next-generation anthrax vaccine. Ivins, it turned out, also was a man the FBI consulted frequently to learn the science behind the attacks. The Mirage Man reveals how this seemingly harmless if eccentric scientist hid a sinister secret life from his closest associates and family, and how the trail of genetic and circumstantial evidence led inexorably to him. Along the way, Willman exposes the faulty investigative work that led to the public smearing of the wrong man, Steven Hatfill, a scientist specializing in biowarfare preparedness whose life was upended by media stakeouts and op-ed-page witch hunts. 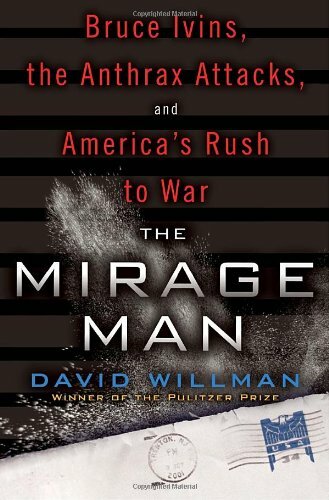 Engrossing and unsparing, The Mirage Man is a portrait of a deeply troubled scientist who for more than twenty years had unlimited access to the U.S. Armyâ€™s stocks of deadly anthrax. It is also the story of a struggle for control within the FBI investigation, the missteps of an overzealous press, and how a cadre of government officials disregarded scientific data while spinning the letter attacks into a basis for war. As The Mirage Man makes clear, America must, at last, come to terms with the lessons to be learned from what Bruce Ivins wrought. The nationâ€™s security depends on it. 2017-01-19[PDF] The Anthrax Letters: A Medical Detective Story. No comments for "[PDF] The Mirage Man: Bruce Ivins, the Anthrax Attacks, and America's Rush to War".